Catherine Holman Folk Art: Going Away Party! Wow! It's been almost a month since my last post! First of all I would like to thank everyone for their kind words of encouragement and prayers for my mother. She is doing very well and working hard to get that knee back in working order. The other reason I've been away so long is because we've been working away at helping this good looking guy, our son Eric, get packed and ready to leave for Spain. He left on Tuesday and arrived safely in Madrid and is on the hunt for an apartment. You can watch his journey for the next 9 months on his blog "Shuffle the Cards". I believe this title was the name of the painting on his blog that was done by a famous artist in the part of Spain where he will be teaching. I'm wayyyyyyyy behind on painting but hope to get back to work soon as my mother heals. Can't wait to pick up a brush! Welcome back to the blog world mom! I love you! Hey Catherine, glad to see you back, I've missed your posts and artwork. Glad your mom is doing better and congrats to your son...I hope he really enjoys teaching in Spain. It was so glad to see your post this morning! I was worried about you! Good luck to your son in Spain! Have fun creating some new paintings! You were very missed in blogland. Glad to hear your mom is doing well, it takes time doesn't it. I got tired of not doing so today, my mom was sponging my card series today, reluctantly but doing it. I too miss picking up my craft daily, so I'll be including my reluctant partner from now on. My mom suffers from dementia so it's a constant questioning of why do I need to do this? and then again in 5sec. after I ask her so ... Lokking forward to seeing your next cupcake. I like your new header. 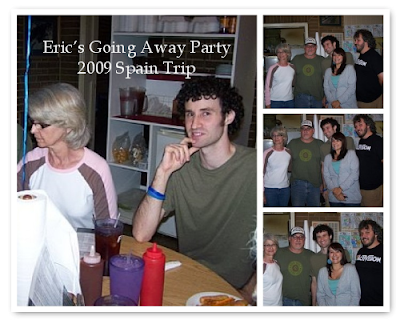 I just visited your son Eric's blog. How exciting for him. Glad you're back and your mother is doing well. Good luck to your son on his adventure to Spain. My brother-in-law spent 2 years in Spain. Looking forward to your new projects. Come visit my comforts of home blog and see all the craziness I am having trying to get my new house ready to move in to! Best wishes to your son. Yes my hair is now gray.